The team over at WorldPix were on the hunt for gallery-level professional printing services for their big art auction benefit event "Arizona For Africa". Watch our new behind-the-scenes video! Whether you're a repeat customer or new to the printing biz, ArtisanHD offers custom digital printing services for you. The 7th Avenue Streetscape Public Art Installation Project inspires sustainability through poetry and imagery. Artisan printed six panels for this installation. Read about ArtisanHD client Asha W., a rising star in the digital photography world. We helped her find the best acrylic prints for her recent gallery showing. 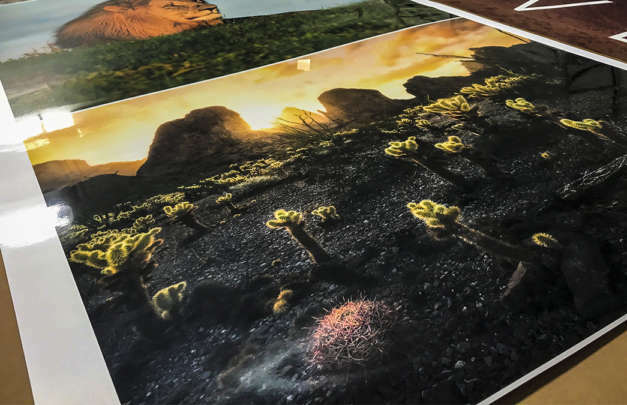 A one-stop-solution for local and national clients, Artisan Colour and ArtisanHD provide high quality printing and perfect color in Scottsdale. We've compiled a list of our favorite Phoenix Area art festivals, so you can explore one near you. We hope you're able to make it to at least one! The Celebration of Fine Art in North Scottsdale is more than just an art show. Check out a few of our HD printing clients and their work.